Knee-hugger is another of the yummy poses. These steps and Figure 17-13 show you how to help your child do it. You can find the adult version in Chapter 14 though there it's called knees-to-chest . For an added benefit have your child rock his knees from side to side while he's hugging them it gently massages the back. 1. Lie on your back and then bend and hug in your knees. 2. Just relax and think good thoughts. 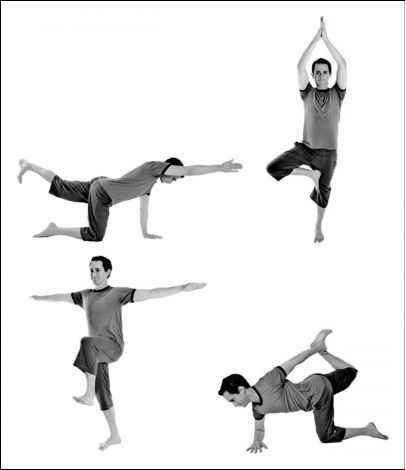 These steps help you achieve this bend illustrated in Figure 18-11 . 1. 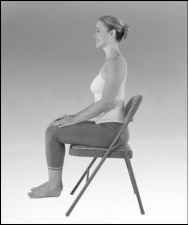 Start in the seated mountain posture. 2. As you exhale, bend forward from your hips and slide your hands forward and down your legs. 3. Let your head and arms hang down and relax in the folded position for 4 to 6 breaths. 4. 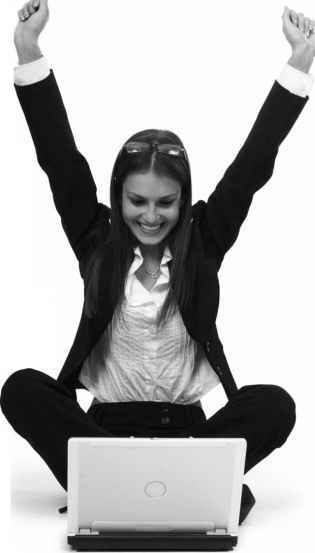 For a nice ending, use the seated mountain posture. Close your eyes and choose focus breathing Chapter 5 or a relaxation technique Chapter 4 for two to five minutes. A twist is almost always followed by a forward bend to rebalance the spine and hips, so here's one to counter the twist in the preceding section. 1. 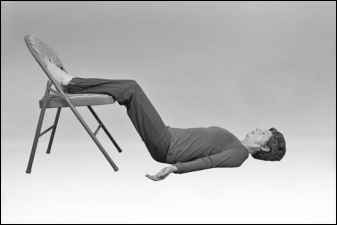 Start in the seated chair posture turned sideways with the chair back on either your left or right. 2. 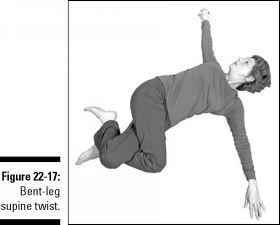 As you exhale, bend forward from the hips and slide your hands down your legs as you hang your head, chest, and arms comfortably as shown in Figure 22-26. 3. 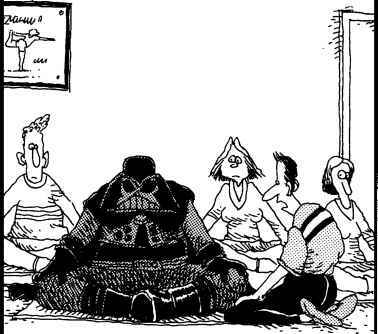 Stay in Step 2 for six to eight breaths. 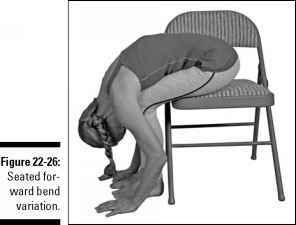 This modified forward bend improves circulation in the head and lengthens the spine, hamstrings, and adductor muscles on the inside of the thighs. 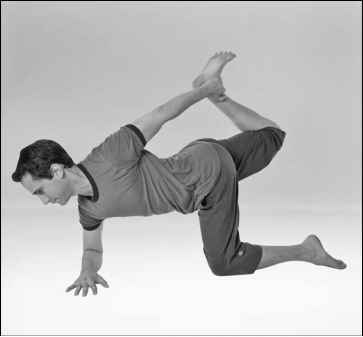 Just hang in this posture shown in Figure 16-7 for 6 to 8 breaths. 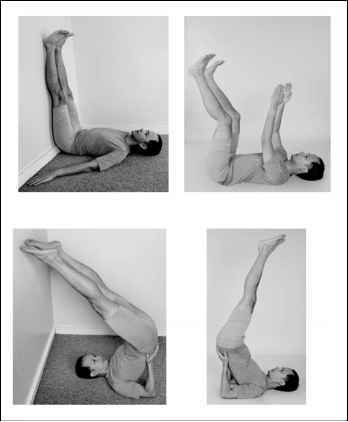 You can also try this standing posture with your hips at a wall or door. 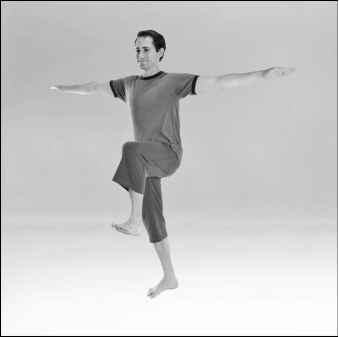 Standing spread-legged forward bend. Standing spread-legged forward bend. All of the concentration, breath, and movement leads to this moment. You may also replace this breathing exercise with any of the relaxation techniques in Chapter 4. 1. 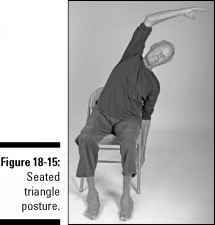 Start in the seated chair posture with your eyes closed as in Figure 22-28. 2. Use belly breathing see Chapter 5 and gradually increase the length of your exhalation until you reach your comfortable maximum. 3. Take 20 to 30 belly breaths at your comfortable maximum and then gradually come back to your normal resting breath. 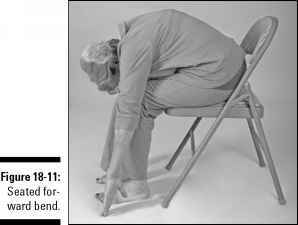 Refer to Figure 18-15 for a visual of this posture and then follow these steps 1. 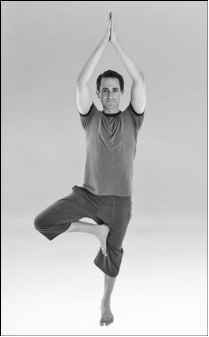 Start in the seated mountain posture and, as you inhale, raise your right arm out and up from the right side with your palm rotated inward toward your head. 2. 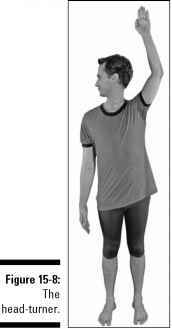 As you exhale, lean your right arm, head, and torso to the left as you drop your left arm down. Keep your hips on the seat of the chair. 3. 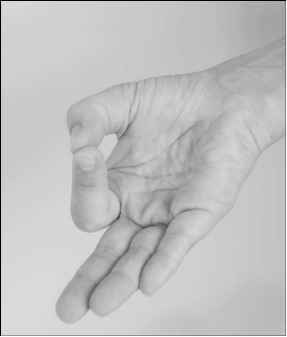 Hold Step 2 for 4 to 6 breaths and then repeat Steps 1 through 3 on the opposite side with the left arm .